It is essential that the mating faces between an ultrasonic transducer/booster and a booster/horn be flat and parallel. If any air gaps remain, there will be a resultant loss in power output and efficiency. Coupling may be so poor that it might prevent the starting of an ultrasonic stack. 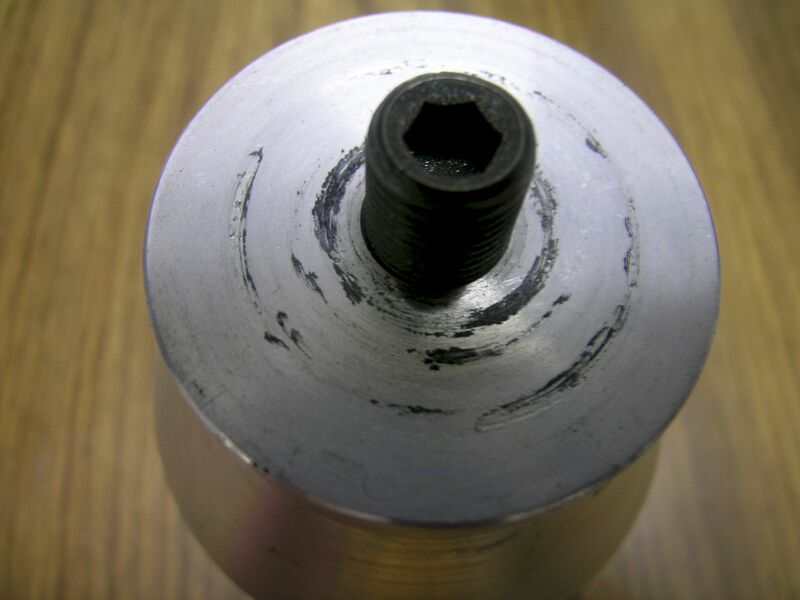 The condition of excessive crowning, or uneven contact surfaces, is normally evidenced by a burnished appearance only around the bolt area of the contact surfaces. This indicates that contact between the components is occurring only at the burnished area and not around the periphery of the surfaces. The contact areas between components can build up excessive heat due to inefficiency of vibratory transmission between the components. Horns (Sonotrodes): 0.0010 in. for 20 kHz and 0.0010 in. for 40 kHz. Examples of the ultrasonic horn surface not being flat. Here is an example where only 10% of the surface is making contact with the booster interface. When any of the contact surfaces look like the examples given, please send your tooling to the original manufacturer for re-surfacing. This will extend the tooling life as well as reduce the probability of permanent damage to the components. What if you can’t spare the time to return the ultrasonic horn, booster or transducer for re-surfacing? If the surfaces are just dirty and not gouged in any way, you may be able to lap the surfaces smooth. Disassemble the ultrasonic transducer/booster/horn stack and wipe the mating surfaces with a clean cloth or paper towel. Examine the mating surfaces. If they appear to be in good condition, skip to Step 9. If any surface is corroded or shows a dark, hard deposit, it should be reconditioned (Steps 3 – 8). 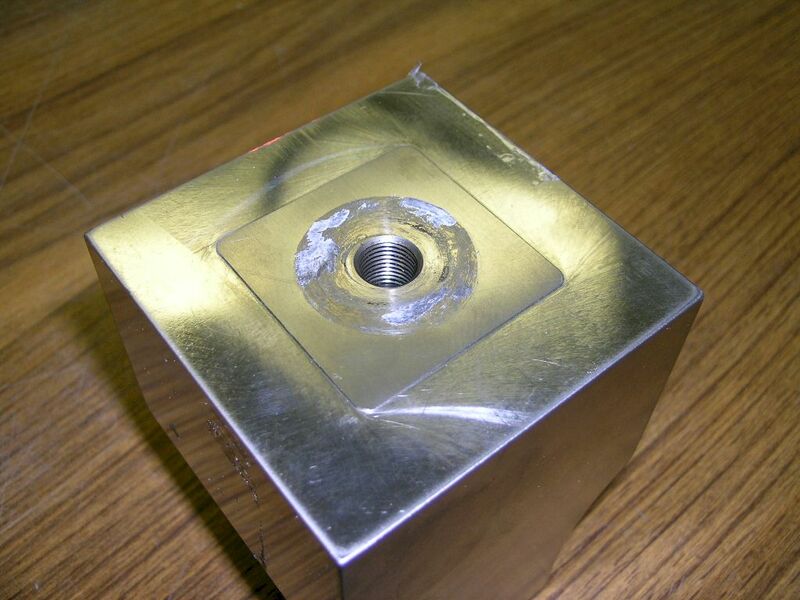 If the mating surface of any component shows evidence of crowning, cupping, or any other out-of-flatness condition, contact an ultrasonics industry professional for advice. Very small, isolated pits in the mating surfaces are generally not a serious problem. If necessary, remove the mounting studs. Tape a clean sheet of #400 (or finer) emery cloth to a clean, smooth, flat surface. A piece of plate glass is usually suitable. Hold the component at its lower end and carefully stroke it in one direction across the emery cloth. Do not apply pressure as the component’s weight alone will suffice. NOTE: Use extreme care to avoid tilting the component. 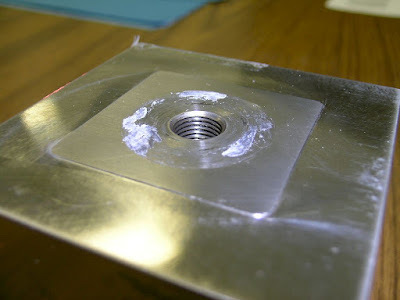 Loss of flatness on interface surfaces may render the welding system inoperative. Perform a second stroke, then rotate the part one-third turn and repeat. Turn the part the final one-third and perform the same two strokes. Be certain to perform the same number of strokes (two) at each location. Re-examine the mating surfaces, and repeat steps 5 through 7 until most of the contaminate has been removed. This should not take more than two or three complete rotations. Before reinserting a stud, examine it to make sure the threads have not been damaged. Clean all foreign material, grease and oil from the threads of the stud and the threaded hole, using a clean cloth or towel. Replace worn or damaged studs with those specified by the manufacturer. Ordinary steel set screws are not properly heat treated for use as stack studs. Very lightly coat the flat mating surfaces with high-pressure silicone grease or insert a high-temperature polymer film washer (not both) to promote good transmission of ultrasound and to prevent the stack components from “cladding” together. Torque studs and mating surfaces properly, as indicated in the accompanying table showing Correct Torque Values for Stack Component Assembly. Loose studs or joints will cause overloads or intermittent operation, while excessive tightening results in material distortion that shortens component life. Install the stack in the welder and test ultrasonic operation.